International competition in the automotive industry is constantly on the rise, leading to greater reliance upon maximum efficiency in production in particular. This all begins with the moulding of sheet steel, which can be up to 2.5 mm thick, into the desired body shape. The innovative servo presses from Göppingen-based Schuler AG are playing an increasingly important role in this process. The leading supplier of metal forming technology has already delivered over 200 press lines and presses with ServoDirect technology (SDT) worldwide. High performance is also required when it comes to the components: Schuler relies on LAPP’s control cables, power cables, data cables and BUS cables. Press lines and presses with ServoDirect technology are considered to be particularly powerful, and have several main advantages. Servo presses enable at least 30% more parts to be shaped compared with plants that are purely hydraulic, whilst saving up to 40% of the power for the same output quantity. 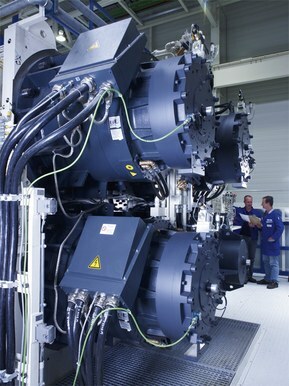 On top of that is the high efficiency of the motors with a maximum power of 750 kW per metre. One press can contain up to four powerful drives, which are characterised by their high torques and can be called into action at even the lowest speed. In a significantly smaller design, a great deal more of these motors can also be installed in the transfer systems for transporting parts within the press lines – the Crossbar Feeders from Schuler. Thanks to the dynamic, directly controllable servo motors, the ram movement can be delayed or accelerated both before and after the forming stage. The result: the cycle time is reduced. Conventional presses with a flywheel drive are not able to do this. Their speed and stroke rate are dictated by the highest possible forming speed. Through the computerised simulation of complex, interrelated motion sequences, the efficiency of the servo presses can be further improved with regard to energy consumption and productivity. This allows tools, which assist the press in shaping the components, to be designed in such a way that they can make full use of the possibilities offered by ServoDirect technology in terms of dynamics and flexibility. The demands on the electrical cables within a press line are correspondingly high. “They have to withstand the entire load in order to enable efficient operation”, explains Gert Horn, Head of Electrical Engineering in the field of Automotive Press Technology at Schuler AG. It is for this reason that the cable and connection technology from the Stuttgart-based LAPP features predominantly in Schuler’s servo press lines and presses. On average, around 55 kilometres of cable is installed in a servo press line. The majority of this is made up of control cables and power cables for the motors, but also data cables and BUS cables. After all, the cables not only provide a current supply to the 160 total drives, but also transport huge amounts of information and data necessary for monitoring and controlling the entire plant. 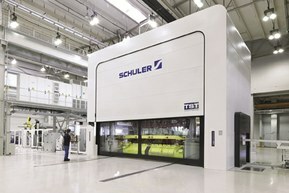 For their monoblock servo press (machine consists of a welded part with table, stand and head piece, weighing up to 800 tonnes), Schuler mainly uses the ÖLFLEX® CLASSIC 110 connection and control cables for the internal cabling. For example, these cables are used for the cable installation in the press stand, as connecting cables to the control cabinet, as feed and discharge lines for the lubricating oil unit or on the socket panel of the machine. Schuler uses the surface-mount bases there as distributor boxes. Here, the lines to the four earthing sockets, to four machine lamps, to the guard door limit switch and to the pressure switch for the ram equilibration are connected using the ÖLFLEX® CLASSIC 110. Wherever the effects of electrical fields need to be taken into account, the screened ÖFLEX® CLASSIC 115 CY is also used. For Profibus connections, Schuler uses the UNITRONIC® BUS PB FD P and UNITRONIC® BUS PB FD PA data network cables in the monoblocks. Of course, the increased acceleration of the tools results in greater demands on the energy supply systems and their components and cables. The tension, shear, bending and torsional loads involved here all have to be reconciled with the desire for maximum endurance and minimum space requirements, plus lower weight and a smaller minimum bending radius. That is why at Schuler, where cables are subject to bending during operation, the ÖLFLEX® CLASSIC FD 855 P and ÖLFLEX® CLASSIC FD 855 CP are used, for example for connecting the head piece to the ram, which is constantly moving up and down. The cables can withstand harsh conditions with their low-adhesive surface, oil-resistant, halogen-free and flame-retardant properties, and are designed for up to five million alternating bending cycles in a power chain. What's more, in order to avoid load peaks, the servo presses are also equipped with standard flywheel technology: “No longer as a drive, but rather as energy storage units in the form of electric motors”, says Gert Horn. “They are installed in the basement underneath the plant and run continuously. The energy storage units are designed to cope with load peaks which would otherwise put serious strain on the power supply in a press line.” To date, each individual press within a line has had its own separate energy storage unit. As the technological and global market leader in metalforming, Schuler supplies machines, production lines, dies, process know-how and services for the entire metal-working industry. Its clients include car manufacturers and their suppliers, as well as companies in the forging, household equipment, packaging, energy and electrical industry.